Do you love me anymore? I love you so much that it hurts. Cristina: Do you love me anymore? Owen: I love you so much that it hurts. 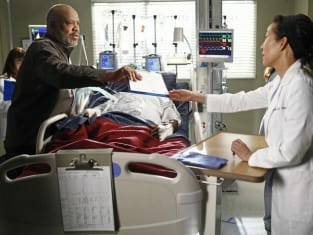 Grey's Anatomy Season 8 Episode 17: "One Step Too Far"
Alex: I felt bad that I had to sit with you all night so you didn't cry yourself to sleep over your sad premie. Morgan: He has a brain bleed! We're trained to be vigilant, to chase down the problem, to ask all the right questions, to find the root cause until we know exactly what it is and we confront it. It takes an extreme amount of caution or we can't overstep ourselves. We can create problems that don't exist. Grey's Anatomy Round Table: "One Step Too Far"